These fun little Valentine’s crowns are ready to print and go! Printing on cardstock will make these crowns a bit sturdier. If you only have copy weight paper they will still be super cute but cardstock will make headbands that will last through an afternoon of parading and playing! Add some color with the medium of your choice. Washable markers are perfect for these. You could even try this fun paint with markers method that I talk about in this post. It gives the look of watercolor paint with none of the mess. You could also crayons, colored pencils, or even glitter glue if you’re feeling adventurous! 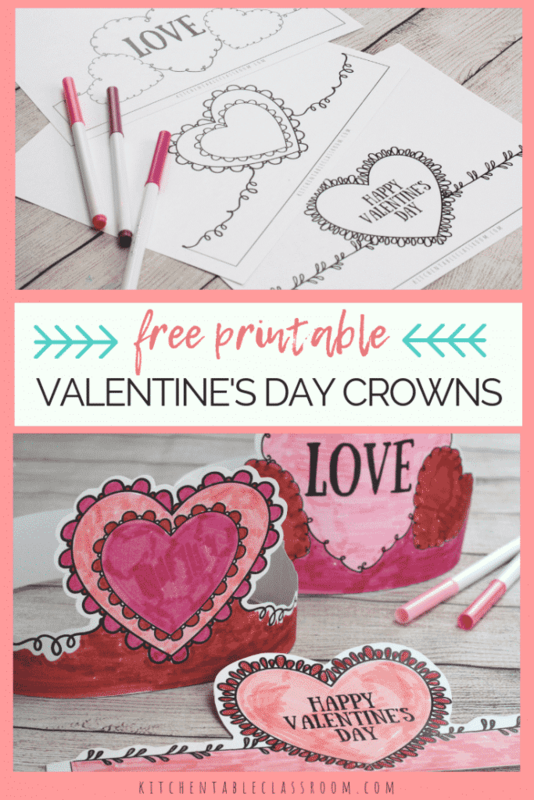 These Valentine’s day crowns will be easiest for your little ones to color if they add color while the headband is flat and not cut out. That way they aren’t trying to color off the edge of the paper. Once your kiddo is done adding color encourage them to cut their headband out. It’s okay not to cut directly on the line as some of the designs have some intricate edges. Encourage your kiddos to do the cutting themselves and cut loosely around any difficult lacy edges! 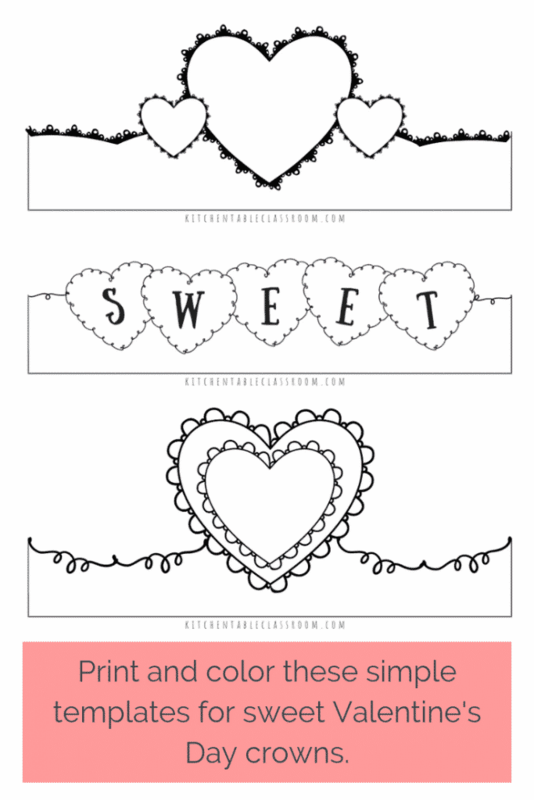 If you’d like to print these Valentine’s Day headbands for use in your home or classroom just use the subscribe form below to become a Kitchen Table Classroom subscriber. Then go check your email and confirm that you meant to subscribe. You’ll get an email that provides you a subscriber only password to my Free Resource LIbrary. There you’ll find these Valentine’s Day headbands as well as over one hundred other free printables in easy to print PDF form. You’ll also receive an email from me that will bring my newest printable resources and creative ideas to your inbox once a week! If you’re already a subscriber there’s no need to subscribe again. Just use that subscriber password to get into the Free Resource Library and download away. If you forgot the password it (along with a link to the library) are at the bottom of every newsletter from me! 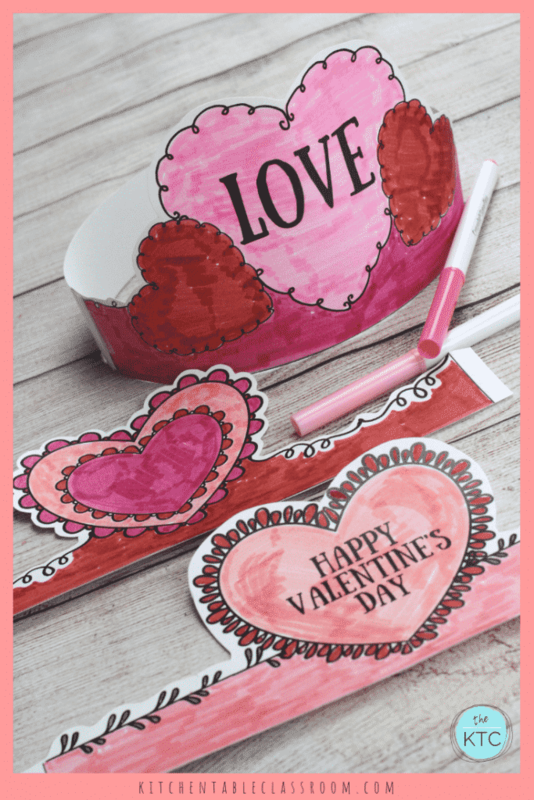 You will need to cut an extra strip of tag board or paper and attach it to the sides of these Valentine’s day headbands in order for them to fit. Since the templates print one headband per page that leaves just enough paper to cut a strip across the long edge of the paper to use for this purpose. Attach with tape one one side of the headband and adjust to fit before taping the other side! Done! 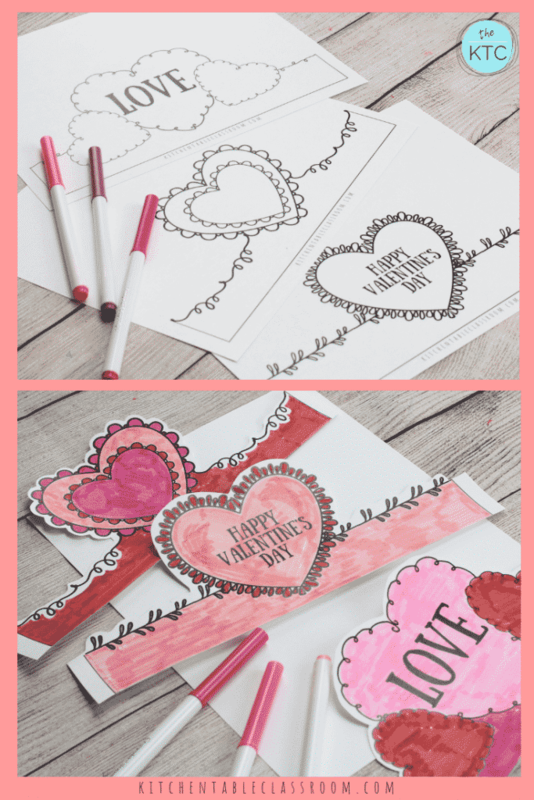 More Valentine’s Day crafts and printables…..
Valentine’s Day lends itself to all kinds of fun crafts and projects. Here a few Kitchen Table Classroom ideas to add to your list! Use markers for heart printmaking. This is a quick way to make lots of handmade Valentine’s Day cards! These Valentine’s Day cards print in black and white and ready for your kiddo to add color! Make your own treat bags with with this quick stencil method. 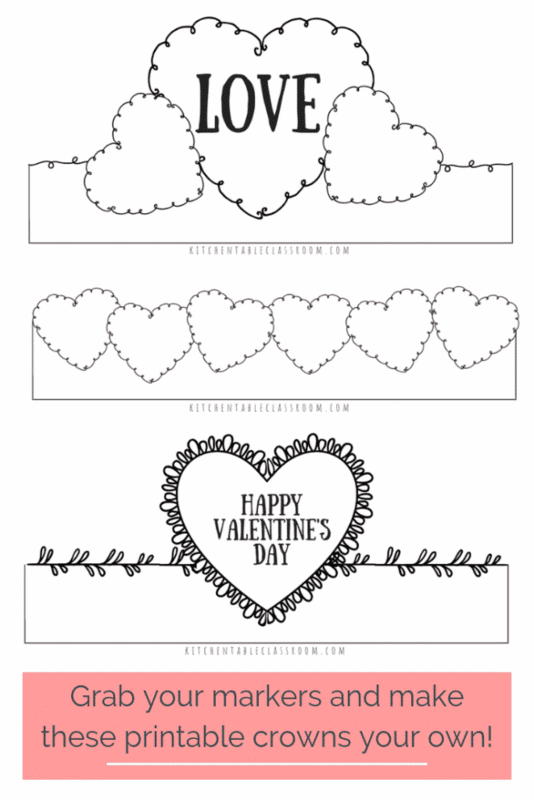 Add a few minutes of creative relaxation to your day with these printable Valentine’s Day coloring pages and drawing prompts. If you enjoyed these Valentine’s Day headbands please share them so someone else can too! Sharing a post helps me to grow and bring you more goodies! I’d be so grateful for you taking a few minutes out of your day to share this pic on your favorite social media channel!